Home » ccna exploration 2 final Exam » Refer to the exhibit. Two connected routers are unable to establish adjacency. 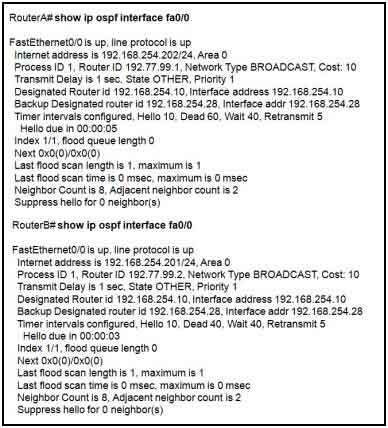 Based on the show ip ospf interface output, what could be the problem? Refer to the exhibit. Two connected routers are unable to establish adjacency. Based on the show ip ospf interface output, what could be the problem? The dead timers do not match. The routers have not reached full state. The two routers are in different autonomous systems. The physical interface between the two routers is down.